Microsoft and Google are battling in the court room for the right of Windows Phone 8 users. On the other hand, Windows 8 OS, which is inspired from the same Modern UI of WP8, has started growing at a slow but steady pace. 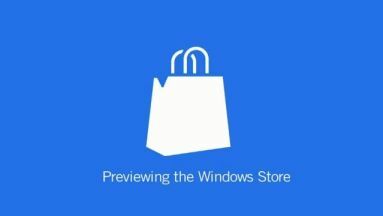 The new Windows store has become a synonym of marketplace for applications. The idea of creating a single place or a so called marketplace and share the apps with the user is not new. Apple and Google are already using the same concept to distribute apps to their users. Consonantly, Microsoft learned the how to be organized and manage applications from the competitors. The mantra of the successful ecosystem seems to be infallible: everything depends on the quality of apps available in the marketplace. YouTube, a creation of Google, has been the destination of the movie or video lovers. The platform is so enormous and useful for the content distributor as well as seekers. For the latter part of the group, there are some quality YouTube players available in the Windows store. The post revolves around the same theme. 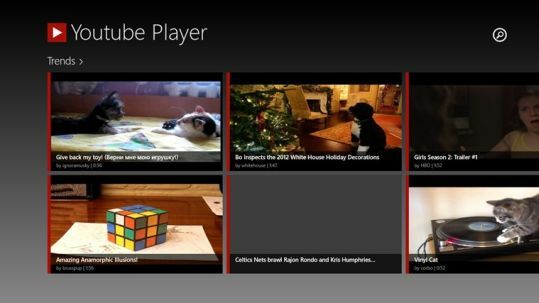 In fact, we are going to share 5 best YouTube apps for Windows 8 users. Even in the past, we shared YouTube player for Windows 8, which rightly deserves to be called as one of the best YouTube app for Windows 8. Since then, we’ve tried dozens of applications on our device and some of them found a permanent place on our hard disk. Let’s see whether they manage to persuade your mind or not. 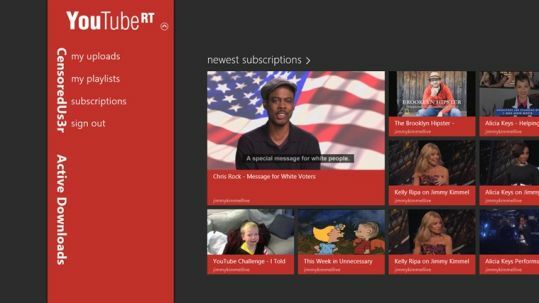 Following are some of the best YouTube clients for new Windows 8 users. They are in no particular order of their usefulness. Overall, YouTube RT is your perfect companion. Go for it, if you’re willing to invest some money in a decent YouTube app for your Windows 8 device. Do you enjoy YouTubing? If the answer is emphatically YES, then PrimeTube is probably the best YouTube app for you. It has one of the most intriguing interface and has a plethora of inbuilt options to enjoy video to the core. No matter, whether you’re on Windows 8 PC, tablet or laptop, PrimeTube works flawlessly on all the device. It brings together the beauty of Modern UI and YouTube player. The app is created by the famous Windows Phone developer. It also brings the ease of clicking, recording and uploading videos to your personal channel without any hassle. PrimeTube saves videos in the background so you can watch them without exceeding bandwidth limit. The intuitive interface of the PrimeTube also allows you to manage your favorites, playlist and subscription from the single interface. It even lets you manage channels, tracks and playlists from the YouTube. 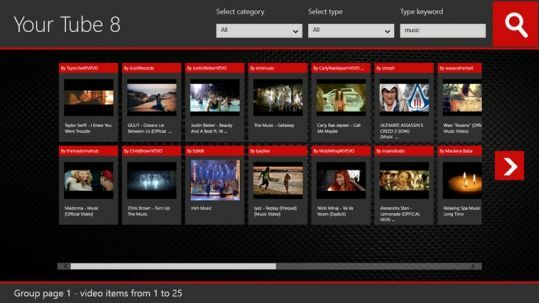 There is also a provision to play continuous video from your playlist and favorites video. 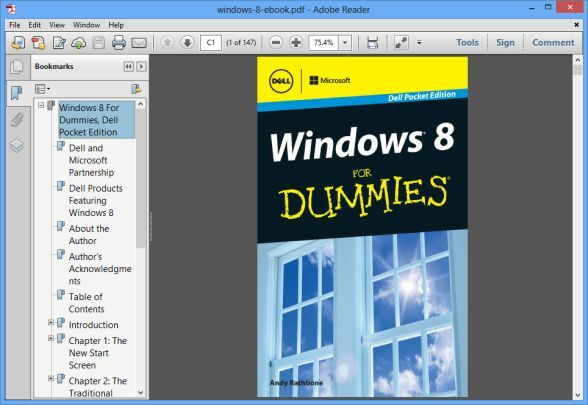 Such features give you uninterrupted supply of the entertainment to your Windows 8 device. Yet another paid YouTube player app craving to become the best YouTube client for Windows 8. The free version of YouTube+ is ad supported, but gives you a taste of the full version. The developer has done an excellent job as far as interface and features are concerned. Users can login into their account and manage it from here. In order to do so, they are required to authenticate their account, Users can pin feed to application homepage and/or Windows start screen. This is an added bonus for the people who do not like to switch between start menu and application interface. Video downloading support is also provided with pause, resume support. 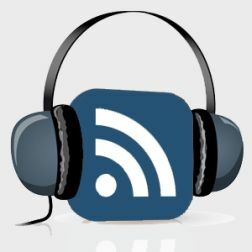 Even, playlist and repeat mode also supported by the application. In a nutshell, it brings your entire YouTube account to Windows 8 desktop. A slimmed down version of the YouTube player, which we reviewed in the past. As a free player, it does offer some solid features, but again it is nothing compared to any of the above players. You can manage your account, use charms bar to set up YouTube playlist, search videos, change video definition (SD, HD, 1080p etc.) and share videos with your Facebook friends with the Windows 8 sharing option. You would be required to authenticate this app to connect to your account in order to manage it from the application. Overall, it is a good free app available in the market. It is a free alternative of best paid YouTube Windows 8 apps. Your Tube 8 is a super sleek and simple client for Windows 8. All the videos are displayed in beautiful thumbnails style, which expands upon the click. When you click on the desired video, it will provide the full description of the video. Users can play and share the video from this place. Just click on the video and it will display the video in its full glory. The Windows sharing option will let you share this video to via email or people’s hub. There is also a search option to search your favorite video on the YouTube. Even, you can explore them according to your interest and genre. Which application have you fallen in love with? Have we forgotten to include your application in our list? Feel free to reach us out by any form. We would be more than happy to include your favorite app in the list of best YouTube apps for Windows 8. In case, if you do not mind trying out full-fledged ad-supported version, then YouTube+ is a good choice for you. However, if you are looking to invest money, then you should perhaps go for PrimeTube. 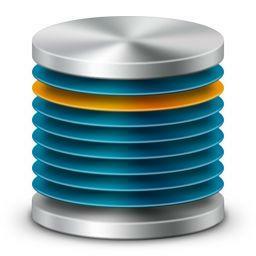 The developer of PrimeTube is known to provide quality application. 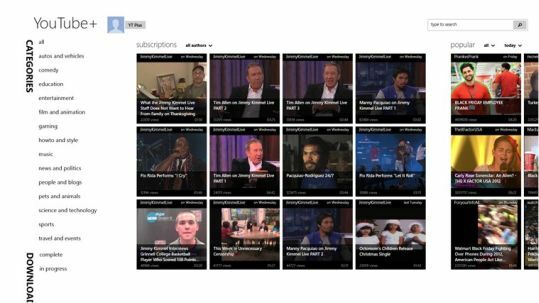 PrimeTube YouTube app for Windows 8 is more solid and offers decent features. awesome list of youtube player’s, Windows 8 lovers surely love it. I am going to use YoutubeRT i think it the best.